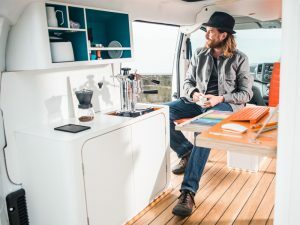 Nissan has collaborated with UK-based design workshop Studio Hardie to convert an electric e-NV200 van into a ‘mobile office’ – named the e-NV200 WORKSPACe. The e-NV200 WORKSPACe concept aims to reflect what desk-based employment could look like in the future. This conversion features integrated fold-out desk, touchscreen computer, wireless internet, smartphone-controlled LED lights, wireless phone charging, Bluetooth audio system, mini fridge and a barista-quality coffee machine. The e-NV200 WORKSPACe concept aims to highlight the customisable potential of the van, and reflect what desk-based employment could look like in the future as hot-desking and flexible working grows in popularity. According to the results of the Global Co-working Survey carried out in 2015, the number of co-working and hot-desking spaces worldwide increased by 36% as small businesses and working professionals looked for increased mobility and a more cost-effective alternative to traditional city-centre office space. Gareth Dunsmore, director of electric vehicles for Nissan Europe, commented: “The e-NV200 WORKSPACe takes the ingenuity of our 100% electric van a step further and by enlisting the design expertise of Studio Hardie – renowned for its creative eco approach – the e-NV200 has been reimagined as an innovative, zero-emission working environment. The e-NV200 WORKSPACe can be rapid charged from empty to 80% power in 30 minutes, and there is an internal mount for a folding Brompton Bike, allowing users to make short trips around the city or complete the ‘last mile’ of any journey as the vehicle charges.